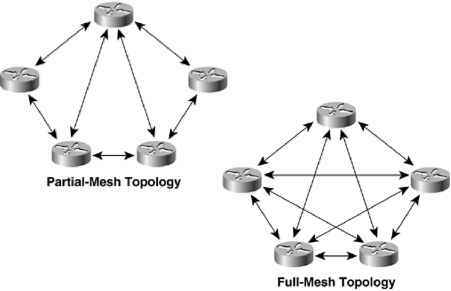 Network designers often recommend a mesh topology to meet availability requirements. 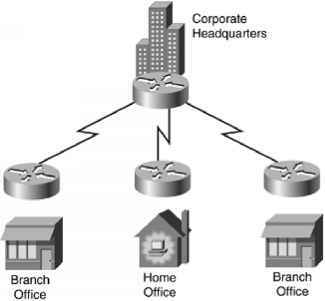 In a full-mesh topology, every router or switch is connected to every other router or switch. A full-mesh network provides complete redundancy, and offers good performance because there is just a single-link delay between any two sites. A partial-mesh network has fewer connections. To reach another router or switch in a partial-mesh network might require traversing intermediate links, as shown in Figure 5-3. Although mesh networks feature good reliability, they have many disadvantages if they are not designed carefully. Mesh networks can be expensive to deploy and maintain. (A full-mesh network is especially expensive.) Mesh networks can also be hard to optimize, troubleshoot, and upgrade, unless they are designed using a simple, hierarchical model. In a nonhierarchical mesh topology, internetworking devices are not optimized for specific functions. Containing network problems is difficult because of the lack of modularity. Network upgrades are problematic because it is difficult to upgrade just one part of a network. Mesh networks have scalability limits for groups of routers that broadcast routing updates or service advertisements. As the number of router CPU adjacencies increases, the amount of bandwidth and CPU resources devoted to processing updates increases. A good rule of thumb is that you should keep broadcast traffic at less than 20 percent of the traffic on each link. This rule limits the number of adjacent routers that can exchange routing tables and service advertisements. This limitation is not a problem, however, if you follow guidelines for simple, hierarchical design. A hierarchical design, by its very nature, limits the number of router adjacencies. With routing protocols, such as OSPF and EIGRP, the problem is not with the broadcast/multicast traffic and CPU resources used for day-to-day routing. The problem is the amount of work and bandwidth required to reestablish routing after an outage. Be careful not to let your network grow into a complicated mesh just because it's still working. There will probably be an outage someday and then you may learn the hard way the downfalls associated with a complex mesh of routers. Figure 5-4 shows a classic hierarchical and redundant enterprise design. The design uses a partial-mesh hierarchy rather than a full mesh. 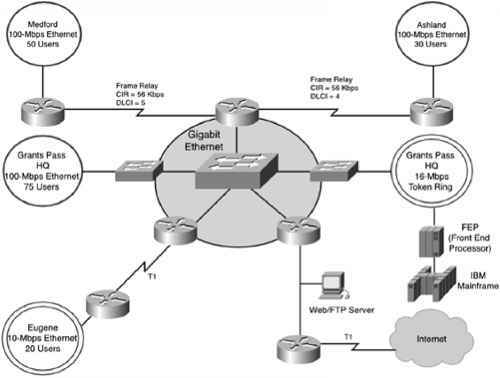 The figure shows an enterprise routed network, but the topology could be used for a switched campus network also. For small and medium-sized companies, the hierarchical model is often implemented as a hub-and-spoke topology with little or no meshing. Corporate headquarters or a data center form the hub. Links to remote offices and telecommuters' homes form the spokes as shown in Figure 5-5. What does a partial mesh look like? 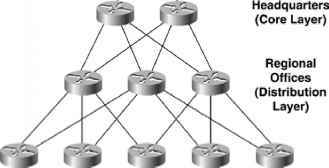 What are the dfference between mesh and hierarchial network topology? How to differ from hierarchical and mesh topologies?